Packing for an African safari is always a challenge for photographers and photo enthusiasts. We do not want to end up in Africa with too little or too much gear. We need to have more than one camera, both as a backup in case one fails, but also to keep one camera with a wide lens and one with a long zoom lens. Changing lenses when on a dusty safari is not optimal for keeping a clean sensor. 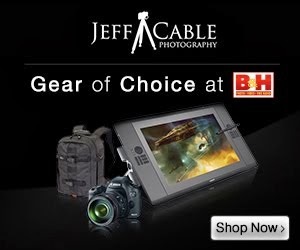 I am bringing two camera bodies (Canon 1D X Mark II and Canon 5D Mark IV) and a fair amount of lenses and accessories. I packed all camera gear into my larger ThinkTank Airport Security 3 rolling bag a couple of days ago (after returning from Las Vegas) and then yesterday decided to repack into my smaller ThinkTank Streetwalker Rolling backpack. 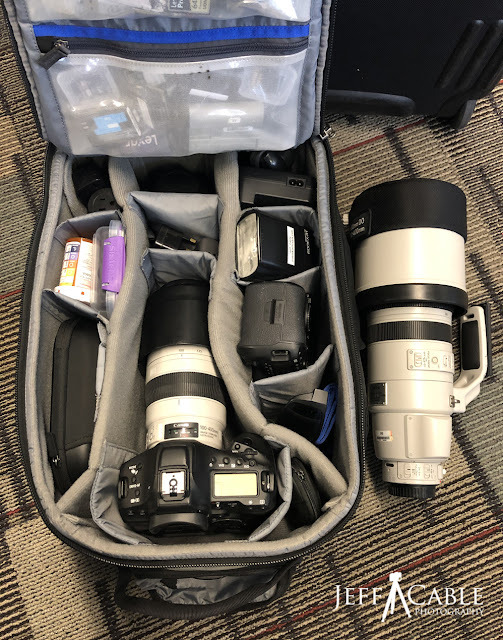 As you can see, I packed both cameras, a Canon 24-105mm lens, a Canon 100-400mm lens and a bunch of accessories into my rolling backpack. I decided to hand carry the Canon 200-400mm lens with me outside the pack, saving room for all the other goodies. Unlike our guests who can pack just what they need, I bring extra memory cards, card readers, filters, backup devices, and a sensor cleaner in case our guests need assistance. I am in Tanzania for the next month leading two photo tours, and for the first time we will have many guests using the Canon 200-400mm zoom lens. Thank you to Canon's CPS who provides free loaner cameras and lenses to my guests!!! This morning I got up at 5am and made it to San Francisco International Airport by 6:15am. I am currently on the first leg of my long flight to Africa. I am happy to have one of my favorite couples on board who went with me to Costa Rica and are joining us in Tanzania for the next couple of weeks. Glenn was able to pack his two camera bodies, the 200-400mm lens and the 100-400mm lens all in his Thinktank backpack. Pretty impressive. I may not be able to blog much for the next two weeks since the Internet access in Tanzania is not that fast and writing time is limited. I do plan to post daily images to my Instagram, Facebook, Twitter, and LinkedIn accounts, so check there to see what we are seeing each day.